Beef, sugar, soy sauce, worcestershire sauce, chili sauce, vinegar, black pepper, natural smoke flavoring, spices. The first thing I taste from the surface of these pieces is a lot of sweetness, followed quickly by a spicy, saucy flavor, much like the chili sauce mixed with worcestershire. There's a fair amount of burn building up. The chewing flavor starts with more definition from the chili sauce and worcestershire, but with a tanginess, and some natural meat flavors. Meanwhile, the heat intensifies a bit. For being labeled as "Cajun Style", I'd say this holds up to that name quite well. I do get a rich spice blend, along with a good deal of burn. I can even pick up the chili sauce flavor, as well as a light chile pepper flavor, but mostly in the latter part of chewing. I also feel that rush of capsaicin flowing through my blood vessels, just as if I were eating hot chile peppers. On my personal heat scale, I'd rank this as medium hot (level 4 out of 5). It has plenty of burn to please the hot food lover, but not intensely hot that I have to pause in between bites. 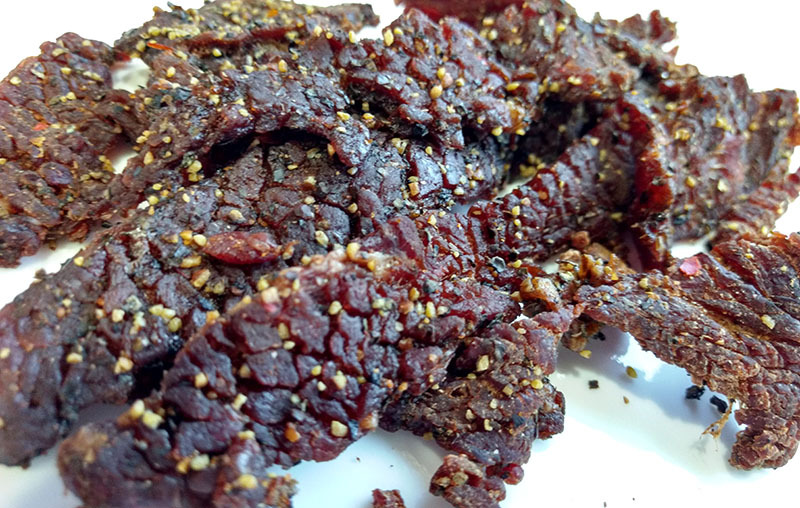 The dominant flavor of this jerky seems to be that mixture of chili sauce and worcestershire, with a lot of sweetness. It's a like a heavily sweetened chile sauce with a steak-sauce appeal. In the chewing, there's a tanginess that excites the taste buds and increases the snackability. The natural meat flavors come through mostly towards the latter part of chewing, as the thicker, sweeter sauce flavor wears off. By that time, the chili sauce becomes more noticeable. I can also pick up some black pepper flavor towards that latter part of chewing in the back of my mouth. The level of saltiness in this feels like its between medium and high, but likely exacerbated by the spiciness. Overall, what you're going to notice in this is a sweetened chili sauce flavor with worcestershire mixed in, along with a light natural meat flavor and some black pepper. 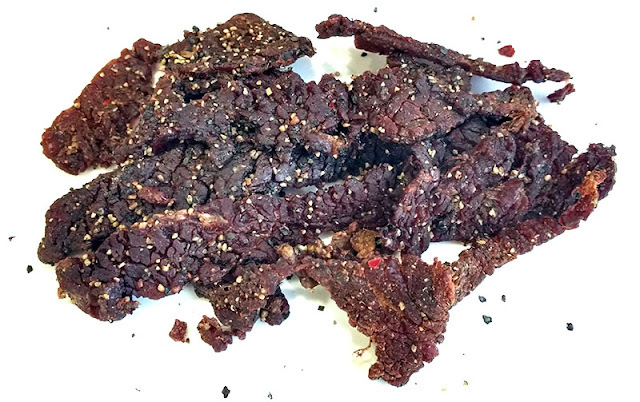 This is a semi-moist jerky, with a mostly dry, but still slightly semi-moist surface feel. These strips are very soft, and very flexible. It's easy to bite chunks off from these strips, and chewing is very easy. The chewing texture starts off feeling soft and tender with a light bit of initial chewing resistance. It chews down to a soft mass rather easily. At that point, it has a steak-like feel, but more soft, though not mushy. There's very little fat noticeable on these strips, unlike the other varieties I reviewed from Jeff's. I don't see any tendon or gristle, but I do get a good deal of stringiness, and some of that stringiness remains in my mouth as unchewable wads of tissue. As for clean eating, I get a light bit of stickiness on my fingertips, but not enough to require a licking or wiping. I don't find any bits of meat or seasoning flying off as I bite off chunks. 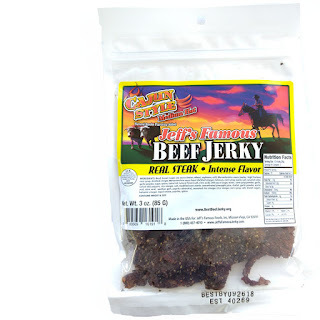 Jeff's Gourmet Jerky sells this Cajun Style variety from it's website at a price of $39.95 for a 6 pack, with each package at 3oz. Add to that shipping of $12.20, and it works out to a price of $2.90 per ounce. 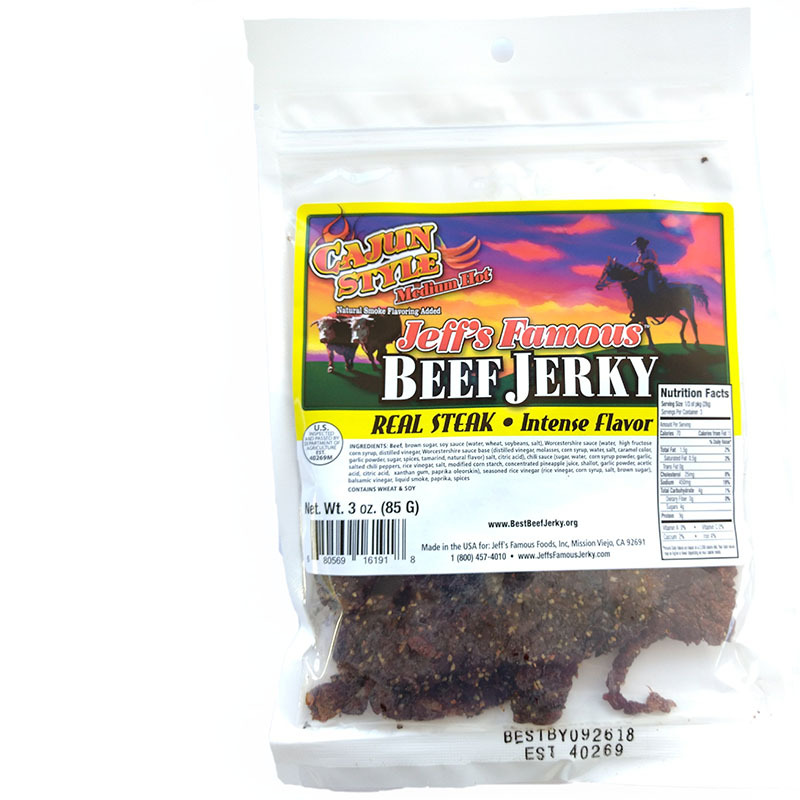 For general jerky snacking purposes, at the $2.90 per ounce price, it's a good value. I get a lot of snackability for an excellent overall flavor, good meat consistency and decent chewing texture. That price is a lot higher than what you pay for the major brands of jerky in grocery stores, but it's a much better flavor and meat consistency. As a Cajun Style beef jerky at the same $2.90 per ounce price, it's a decent value. I do get a lot of heat and spiciness, and I do get a flavor that resembles Cajun style cooking, more so than the major brands of Cajun flavored jerky. This Cajun Style variety from Jeff's Famous Jerky lives up to its advertised flavor with a sweetened chili sauce flavor mixed with worcestershire, combining the sweet & hot with a steakhouse flavor that I found very delicious. There's even a light bit of tanginess in the chewing that created some eye-opening chewing enjoyment. But it's a jerky intended for hot food lovers, dishing up enough heat to warm up your bloodstream without scalding you too much, thereby allowing you to continue feeding your face with endless jerky madness. I also found this easy to eat, with a meaty consistency and good chewing texture. My recommended beer pairing for this, go with a belgian ale like a Delirium Tremens or a Duvel, the sweeter, candied flavor of the ale should work well with the sweeter, tanginess of the chewing.